Just like in any other international airport, going to China requires every passport holder to get a Visa. To many, getting a Visa is quite difficult and time consuming – most especially to international business traveller whose time is money. 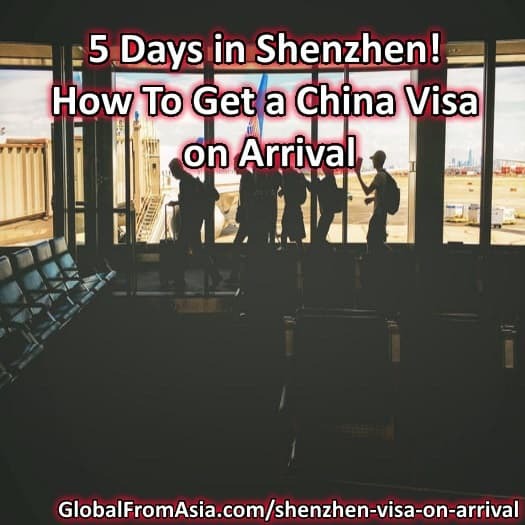 However, if you plan to go to China and stay for not more than 5 days, acquiring a visa is easy and can actually be acquired upon arrival at Shenzhen. Whether you’re travelling to China for business or for pleasure, this 5-day Visa upon arrival is great. Below are some frequently asked questions regarding this 5 day VOA Visa. First off, to acquire this type of Visa, you must travel by land from Hongkong. Hopping across to Shenzhen China from Hongkong make this 5 day visa on arrival possible and less complicated. Passport, immigration form, and money to pay the visa. Which passport holders can it apply to? Where can I get a Visa on arrival? Luohu Port: The easiest and simplest way to get to Luohu Port is by taking the MTR East Rail Line going to Lo Wu or Lok Ma Chau Station. Upon arrival, just follow the signs that say “Foreigners” and look for a sign that says “Port Visa”, you should be able to apply for your visa there. Travel time should be under an hour. You can apply for VOA from 6:30 am to mid night. Huanggang Port: From Tsim Sha Tsui, there’s a bus that goes directly to Huanggang Entry Port, travel is time is about 40 minutes. If you prefer to take the MTR: Central > Mong Kok > Mong Kok East Station > Lok Ma Chau Station > Huanggang border. Huanggang port is a full-time port in China, it means you can apply for VOA at the immigration any time of the day. When was this 5 day visa on arrival introduced? The Shenzhen Visa upon arrival was reintroduced earlier this year, but this was long implemented. There’s already a 5 day VOA in 2008, when Beijing Olympics took place. The thing about Chinese government is that it likes to switch and change the rules over which nationalities are eligible for the visa. In fact, the Chinese Foreign Ministry clearly pointed out that the list of eligible nationalities is subject to change without prior notice, hence there really is no way to obtain a final list of nationalities eligible / not eligible to enter China. This 5 day visa’s cost depends on your nationality. For most nationalities, it costs around 160RMB. I’ve read somewhere that the visa fee for American Passport Holder is around RMB 956, and 469RMB for UK passport holders. What can you do in Shenzhen China for 5 days? Shop: Coco Park, Yitian Holiday Plaza, KK Mall and CR Vientiane City plaza – these are the top shopping malls of Shenzhen. If you plan to shop for Electronics, the SEG computer market is the best place to go – this is known for its largest collection of electronic retailers in Asia. If you like to shop for clothes and handicrafts, you may want to try shopping at Dongmen Area – where you can find streets filled with clothing merchandise, and huge shopping centers. Basically, shopping at Shenzhen is quite overwhelming, it’s more like a maze of shops catering almost everything you could think of. Eat: Dim sum, Chinese seafood dishes, Sichuan hot pot, Teochew cuisine and Chow mein – make sure not to miss all these Chinese food while you’re at Shenzhen. Do Business: Shenzhen has the best hardware factories and has a wide variety of products you might want to check out for future/existing business venture. Tourist Spots: Window of the World, Shenzhen Central Park, OCT East, Coco Park, China Folk Culture Village – these are just some of Shenzhen’s many tourist spots. 3. Those not eligible for VOA like Indonesians and Filipinos, can get fined for entering without valid Chinese visa. 5. Only RMB is accepted for visa payment. 6. If you overstay, you might end up at China’s Public Security Bureau and face a hefty fine. Contact our Visa Agents and Get the Help you Need. Connect With a China Visa Agent! I’m Indonesian Chinese decent, going to Hongkong end of this month and would like to go to Shenzhen for 2-3 days. How can I get visa and how much ? If we are a group of 8-11 people, can we get a group visa ? Pls advice. Thank you. Hi, Elly. Are you success to go to Shenzhen? I am also planning to go to Shenzhen. Kindly share your experience.. thank you! If I havent been in China before can I get in with an already used passport but without china stamp?? Is it possible? or did it change? I could get in last year with a used passport but without china stamp on it. Or do I need already been in China once? Thank you for quick help. Hi, would it be possible to have a VOA at the shenzhen airport? We are flying from the Philippines. I just flew from bangkok to Darwin via Shenzhen. When i arrived they said you dont have visa, i said im in transit for 2 and a half hours only and did not know. There was no mention when i booked. After 15 mins of stuffing around, they processed a visa for me and let me continue the journey. Maybe i was lucky. I have a flight ticket from Guangzhou to New Zealand 3days later. I am in Hong Kong now. My single visa has been used. And I dont have time to apply for china visa. Can I apply single entry visa at Lohu or can I buy a flight from Hong Kong to Guangzhou so I can hav a 24hr Transit visa or something?? ?